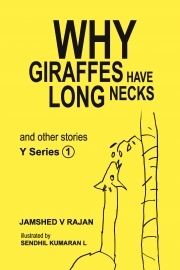 Description of "Why Giraffes have long necks and other stories"
Jamshed V Rajan and Sendhil Kumaran L have teamed up to create this collection of ten stories for children around animals, plants and insects. In these rides of imagination, these short funny stories give wild and wacky reasons for why things are the way they are. At the end of these imaginative stories around animals and plants there are values and morals that your child can learn. Why do giraffes have long necks? Why are beetroots red? Why do porcupines have quills? Why onions have layers and layers of skin? Why do zebras have black and white stripes? Why do tortoises carry their homes on their back? Why do mushrooms look like umbrellas? Why do roosters crow early in the morning? Why do kangaroo babies live in pouches? Why oh why are butterflies so beautiful? Each of these stories come with illustrations which attempt to transport you to the very spot where the story takes place. Let your child’s imagination run loose and have them read this book now! This children's book targeted at kids from four to eight years old is first in the "The Y Series" and more are coming soon. Reviews of "Why Giraffes have long necks and other stories"